v) 40Cr1M0<u>28</u>(5 marks) 1 (b) Explain the modes of failures in the mechanical components. (5 marks) 1 (c) Why factor of safety is necessary in the design of mechanical components? Discuss the important factors influencing the selection of factor of safety. (5 marks) 1 (d) 'Curved beams cannot be designed by applying the simple bending theory of straight beams'. Justify the statement. (5 marks) 1 (e) What is surging of springs? What remedial measures you will suggest to avoid the surging? (5 marks) 2 (a) Design a spigot-socket type cotter joint to transmit an axial load of 42kN. Select appropriate materials for its component and draw its neat sketch showing major dimensions on it. (14 marks) 2 (b) State the following theories of failure and state the relation between yield strength in shear and the yield strength for each of the theory. 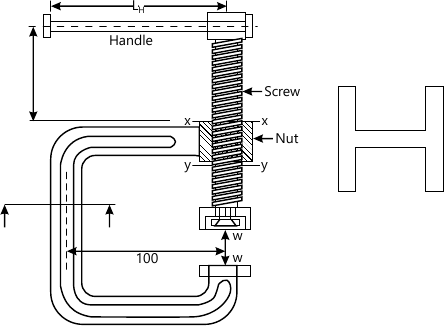 i) yield strength of the screw material=390 N/mm2. ii) Shear strength of the nut and body material=230 N/mm2. Also, design the I-section as shown by the side of figure 1, taking web=flange =4t where t-thickness of flange and web of the I-section of the clamp body. (16 marks) 4 (a) Explain Soderberg diagram and derive equation for a factor of safety based on this concept. (10 marks) 4 (b) The most critical point of component made of steel C40 is subjected to the following variable stresses. Determine the factor of safety based on Soderberg criterion and Octahedral shear theory.